Kids who love arts and crafts will discover that science is fun! 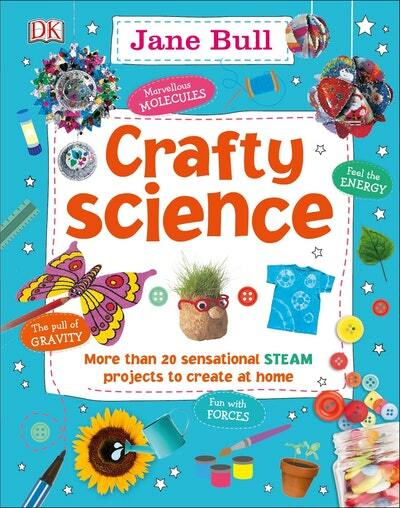 This hands-on crafty science book introduces inquisitive children to the wonders of science through craft projects with everyday objects. Award-winning author Jane Bull combines art, craft, and cooking activities with gentle scientific learning, showing children that science, technology, engineering, art, and maths are all around us - and in everything we make and do! Crafty Science contains over 20 fun-filled projects, each accompanied by a 'What's the science?' section explaining how it works. Children can learn how to make a toy raft and discover what makes their boat float, design and colour a paper butterfly and watch it balance on the tip of a pencil, or create an ice sculpture and learn about the changing states of solids and liquids. With Crafty Science, difficult concepts like buoyancy, gravity, and aerodynamics become meaningful and accessible to young children through play. They'll discover the world around them like they have never seen it before! Love Crafty Science? Subscribe to Read More to find out about similar books.